(TibetanReview.net, Jan26’19) – The Dalai Lama has on Jan 24 addressed a group of 22 Indian scholars and students of Tibetan studies who called on him at his residence. 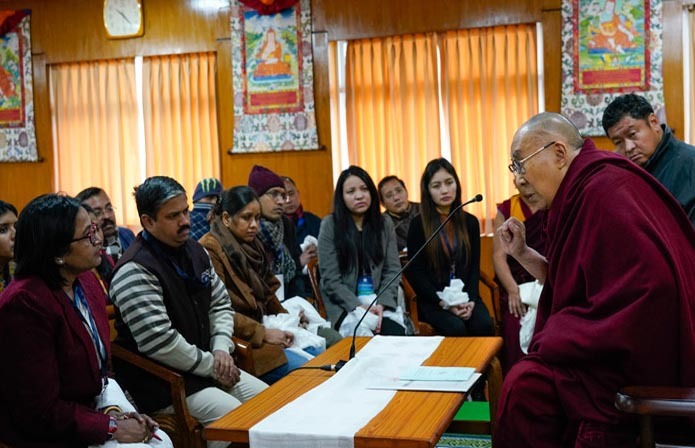 He has spoken to them about his readiness to help revive the ancient Indian understanding of the mind and emotions, reason and logic which Tibet had inherited from the ancient Nalanda University and preserved but which had declined in India itself. “The Nalanda tradition does not only contain the explanation of Buddhism as a religion, it encompasses a profound explanation on understanding of human psychology, emotions and how to tackle them,” he has explained. Noting that the entire corpus of Buddhist texts could be classified into three: Science, mainly mind and emotion; Philosophy, and Religion, Dalai Lama has said that Buddhist science and philosophy could be introduced in education system as an academic subject on human mind and emotions. The 22 visitors included professors as well as PhD and M Phil students from 13 universities across India, including Madras University, Saheed Kshudiram College of West Bengal, Manipal Academy of Higher Education, Gandhigram Rural Institute, Indian Institute of Technology Madras, Nalanda University, South Asian University, Delhi University, Punjab University, Jawaharlal Nehru University, Vivekananda Institute of Professional Studies New Delhi, and Banaras Hindu University. Their meeting with the Dalai Lama took place after the conclusion of a three-day conference of Young Indian Scholars on Tibetan Studies organized by the Tibet Policy Institute of the Central Tibetan Administration.